A break or gap. In discussions of land, an area of land that lies between two parcels but appears from legal descriptions and public records to not be a part of either. 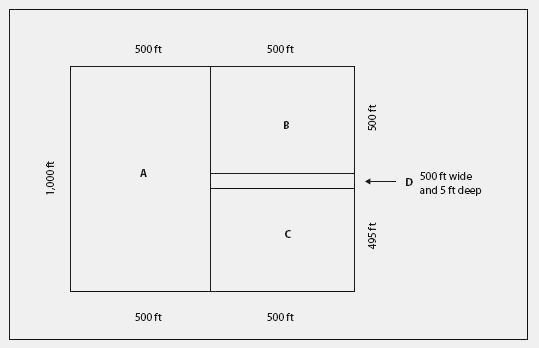 Example: A parcel 1,000 feet by 1,000 feet has been divided. In writing the deeds, though, parcel C's description started at the southeast corner and proceeded northward only 495 feet rather than the full 500 feet necessary to meet the boundary with parcel B. The missing 5 feet is the hiatus. A court might hold that property C's grantor still owns the 5-foot parcel, or it might reform the deed, or it might find that the owner of parcel B adversely possessed the 5-foot parcel. Both the above types were considered as normal and the sacral hiatus was present against 5th and 4th sacral segments. In the past few years, however, they have been forced by the evidence to shift their tactics, switching from denying the hiatus to making feeble attempts to explain it away. Volcanoes are part of the answer but there's no factor that is solely responsible for the hiatus," he said. The stadium wave hypothesis provides a plausible explanation for the hiatus in warming and helps explain why climate models did not predict this hiatus. During these hiatus periods, simulations showed that extra energy entered the oceans, with deeper layers absorbing a disproportionate amount of heat due to changes in oceanic circulation. Sometimes, a hiatus hernia will cause no symptoms but as well as the burning sensation you are experiencing, symptoms can include hiccups and frequent burping. After her 18-month hiatus, Sandler thought about returning to corporate America. TORRANCE, CA -- After experiencing several hiatus in his pro career since the mid-90s, Shiloh Greathouse is back in action. It occurs when acid from the stomach leaks into the gullet, burning the lining and is caused by overeating, alcohol, smoking, or when there is a weakness of the valve at the top of the stomach called a hiatus hernia. VFI), a workforce-development organization founded in 1936, has returned to Lower Manhattan after a five year hiatus in Brooklyn. Telling the intriguing story of Quander's diagnosis of diabetes shortly before his sixth birthday, and his dedicated and courageous pursuit to live a fulfilled and purposeful life, The Quander Quality is the inspirational and deeply personal history of how Quander eventually became on of the sixteen men ordained in the United States when the Permanent Diaconate was revived after an eight-hundred-year hiatus. She was previously on the staff of Farm Industry News but took a hiatus to freelance after the birth of her son five years ago.